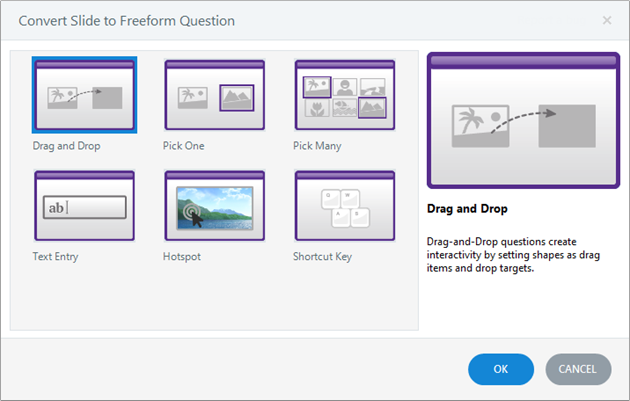 The Convert to Freeform option lets you turn any content into a freeform question or interaction. For example, you might convert pictures into a multiple-choice question, hotspots into a multiple-response question, or photographic characters into a drag-and-drop interaction. The possibilities are limitless. Go to the Insert tab on the ribbon and click Convert to Freeform. Choose one of the freeform interaction types and click OK.
You can edit the behavior of a freeform interaction at any time. Just go to the interaction slide and click Form View in the Question panel in the upper right corner. If you change your mind about a freeform interaction, you can convert it back to a standard slide. In Slide View, go to the Insert tab on the ribbon and click Remove Freeform. Slide objects will remain, but the question elements (feedback, score, etc.) will be removed.